17yo Khemri has just become a prince of an intergalactic empire. But being a prince isn’t at all what he expected. There’s no cruising around the empire in his shiny new ship, having adventures and making his fortune. No, the Emperor will be retiring soon, and Khemri must prepare to compete for the status of new Emperor. 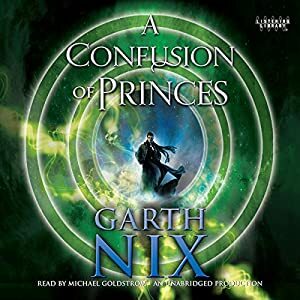 I got this book because I loved the other Garth Nix books I’ve read, and I wanted a book my nephew would enjoy for a road trip. I was a little disappointed in this book. First of all, it wasn’t really age-appropriate for my nephew, who’s 12. I think it would be more appropriate for a 14 or 15 year old. Second, it was a bit boring. The plot had great potential, but it just fell flat for me. I enjoyed the world building, and thought so much more could have been done with it. He was limiting himself with the age range, I think. If he tried the same universe with a target audience of older teens to adults, then it would have been a splendid book.